We are delighted to have been awarded the Leading Parent Partnership Award, the new certificate can be found outside the office. The objectives we have worked towards can be found in the attached document. Please don't hesitate to get in touch if you have questions to ask, suggestions to make or help to offer. Our online safety workshops will be held on Tuesday 13th June, there are sessions at 9:00, 15:30 and 18:00. If you've any questions or queries regarding online safety please contact Mr Ramsden. Just a quick reminder about two events for parents and carers happening in school this week. On Wednesday Mrs Theobald is hosting the Y6 SATs meeting for parents and carers after school. On Thursday Miss Austin is hosting workshops for parents to help your child with reading, this is in addition to our World Book Day Celebration in March. For further details contact Miss Austin or the office. 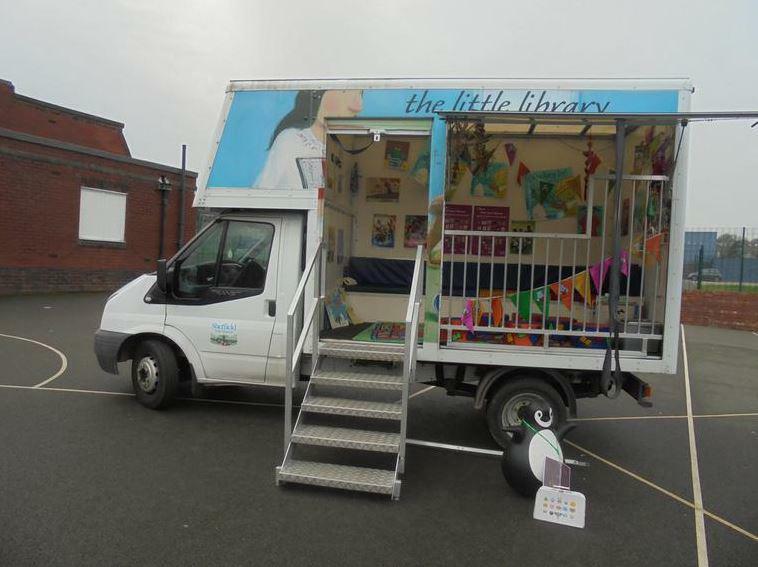 Parents and carers enjoyed coming into school today to work with the Little Library Van from Sheffield Library Service. We enjoy a great relationship with the Library Service and each class regularly receives selections of books to fit with English and topic work. We've attached sign-up sheets below so that you can enroll your child if they aren't already a member. Hard copies are also available at the office. Parents and Carers joined Miss Weston, Mr Ramsden and the Y5/6 Basketball team on Friday night as we provided the half-time entertainment by taking to the court during the half-time interval of the Sheffield Sharks v Worcester Wolves BBL game on Friday night. The match was a thriller going down the the last minute, a video of the whole game available to watch in school (the Sharks v Wolves game wasn't bad either ;-) . If you've not yet given your opinion it's not too late to register on the site to take part. We're delighted that 98% of parents feel that their child is happy at Wisewood. We've already followed up a number of issues raised with individual families including clarifying our policy towards bullying and homework. If you'd like to discuss any of the issues arising please contact the school office to make an appointment or catch Miss Heaphy or Mr Ramsden on the gate. It was great to see so many of you with us at the Sheffield Arena to celebrate the success of our School Choir in participating in this years Young Voices. The event was the culmination of hours of hard work by children and staff and a great night was had by all. The Christmas Newsletter is attached below. We'd like to wish everyone in our school community a wonderful holiday, a Merry Christmas and a Happy New Year. Following feedback from last years questionnaire we have decided to move to an online system and utilise Parent View from OFSTED. Laptops and iPads and help logging in will be available before and after all Christmas performances in order to give everyone the chance to register their views. We'll share the results and our actions with in the Spring Term. Through our Parent Forum you asked if we could reintroduce the newsletters as one way of improving home-school communication. We'll be producing a newsletter each half-term to supplement our Facebook and Twitter feeds. If you've any other ideas for ways we can communicate better please let us know. The latest newsletter is attached below. Thanks to all the parents, carers, friends and family who attended our first problem solving maths workshops today. The children had a great time and it was good to see some of the adults struggling and working together with the children to solve the puzzles. Thanks to those of you who gave feedback, we'll use this to make sure our next events are even better. Thursday 12th May 2016 - Is your child starting at Wisewood in September? Would you like provision to be made at the After-School club? Please find attached a letter for parents of children new to Foundation Stage from September regarding places at After-School club. Minutes from the first meeting of our Parent Forum are attached below. We celebrated World Book Day today with our Festival of Words. Alongside our new reading certificate system we welcomed parents and carers into class and ran workshops on phonics and guided reading. Thanks to all those who attended and made it such a memorable day. If you'd like any further advice on how to help your child with reading outside of school then please get in touch with one of the Wisewood team. Please find attached a letter inviting you to register your interest in becoming part of our new Parent Forum. Replies to Mr Ramsden by Friday 11th march please. Thanks. Thanks to all parents who attended our Christmas Bauble event. The children had a great time sharing their creative skills with family and friends and maybe even teaching them a thing or two. We hope you all have a reminder of the day to hang on the tree at home. Children and parents from Foundation Stage had a great time today at their Christmas writing party. Thanks to all those who attended, the letters will be winging their way to Father Christmas as you read this. Please find attached results of the 2015 Parental Questionnaire. If you've any questions or didn't get chance to complete the survey please contact the School Office or catch Miss Heaphy or Mr Ramsden on the gate. Following lengthy consultations and requests from parents please find attached a letter inviting you to a meeting to discuss the possibility of an After-School Club provision at Wisewood.